Tablets (tablet computers) and similar handheld mobile devices such as smartphones and e-readers are now increasingly in use both for the mainstream public as well as throughout industry. Custom mobile electronic devices are often designed and deployed for specific field applications. These devices have overlap in their features and capabilities. Understanding the principles and features of handheld mobile device design is critical for successful deployment. In preparation for designing a new handheld mobile device, it is important to analyze the requirements of the user as well as the unique use cases of the device within its specialized niche. Beyond portability, what are the requirements of a handheld tablet device design? The fundamental goal for a handheld computing device is to merge a good user experience (UX) with the features and design characteristics that easily enable its application use while operating in difficult environments. Handheld mobile devices commonly feature a display, touchscreen and/or buttons for user interaction, a battery, a rugged enclosure, and often wireless communications or ports for plugging in cables that allow for external communications. These elements must be integrated together in a way that enables functionality without being too heavy or bulky. All text must be easily read and all images and video must be easily viewed over a broad range of lighting conditions, from pitch black through indoor lighting levels, and often in direct sunlight. Touchscreens must correctly detect touches and swipes whether by bare or gloved fingers, in dry and wet environments. Peripherals that do the job: Each device is designed for a purpose, perhaps to sense its environment or to communicate information with a remote server. The mobile device must include the proper circuitry and interfaces to enable the application, and be seamlessly integrated electrically, mechanically, and with supporting software. Power efficiency and battery: Mobile devices are usually battery operated. The battery must have enough capacity to run the typical application over the time required, such as throughout an 8 hour work day within a defined usage profile. Oversizing the battery, while providing excess capacity and increasing the changes of meeting operational time requirements, can make the device larger, heavier, and more expensive. Undersizing the battery, however, may prevent the device from meeting user needs. It is therefore critical that the electronics and software are designed for power efficiency. Streamlined technology and functionality: Given the miniature size of mobile devices and the need to minimize their weight, the level of integration of its components is key. Newer components often provide more integration, lower power, and longer supply chain availability. This must be balanced with component cost, lead time, and sometimes added design time to incorporate. Regulatory certification and licensing: Most electronic products require testing and regulatory certification. For example, FCC Part 15 testing is required for electronic devices sold and used within the United Stated. Similar requirements exist worldwide – IC within Canada, CE within Europe, and more. Wireless portable devices with cellular radios may require additional testing with organizations like PTCRB and GFC as well as with specific cellular providers. The use of specific peripherals, such as Bluetooth, HDMI, and others, may require both interoperability testing and licensing fees. Testing, certification, and licensing all have real cost and schedule impacts that must be factored in when defining product requirements and business cases. Reliability and Durability: Since tablets and other handheld electronic devices are portable, there must be a special emphasis on reliability and durability. The devices will be prone to bumps, drops, vibration, dirt, dust, temperature extremes, and moisture, and must operate through these challenges. The selection of individual components, the design of the enclosure, and the construction of materials must factor in these environmental concerns. Design for ruggedness often involves added cost. In summary, mobile and portable device design requires smart tradeoffs in size, weight, power consumption, and cost (often called SWaP-C within government procurement). Successful design and implementation requires a delicate balance of raw features, power consumption, power efficiency, ergonomics, cost management, and long term supply chain availability. The processes and knowledge combination required to define, design, certify, and manufacture a custom portable device is a specialty, and often best performed by a company with many years of experience and multiple cycles of success. InHand Electronics, Inc. is a leading provider of embedded circuitry systems and software to original equipment manufacturers of wireless, portable, handheld devices. 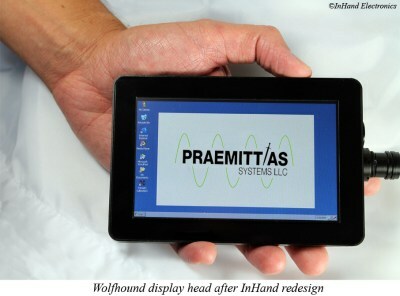 Read more about InHand Electronics on the company’s web site. Contact us for an assessment and quote for your mobile device requirements.